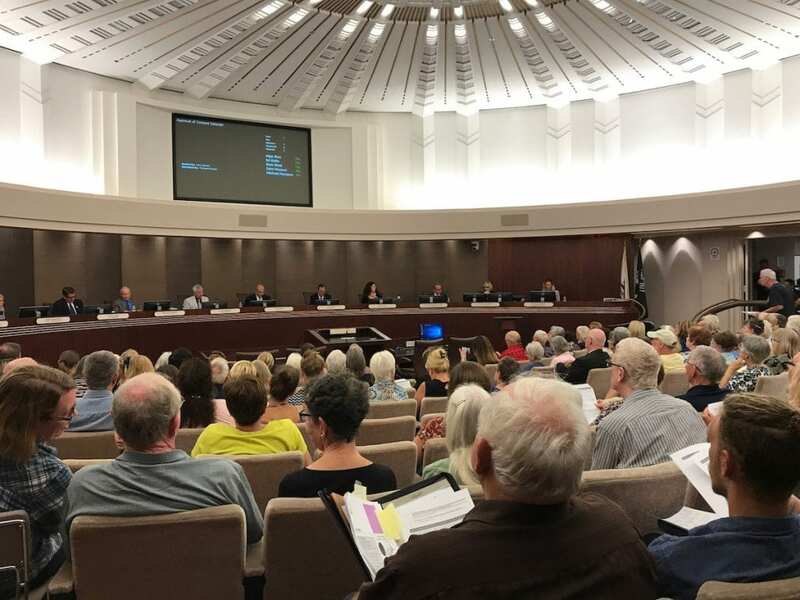 Tonight Escondido City Hall is packed with overflowing crowds. On command about a hundred people held up pieces of papers that said “libraries are sacred” and “librarians make a difference” to cheering. This article is ongoing and updates are being made during the meeting by our Editor, David Ross. When City Mgr Jeff Epp began his presentation, he said the process had been very difficult for staff. 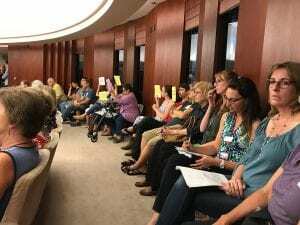 When several people laughed, Mayor Abed admonished the public to treat speakers with respect. Epp did a slide presentation. The first one was a sign where someone had written “outsource Jeff Epp”. When the Chief Operating Officer of Library Systems & Services began speaking, he stated “Our motto is based on a true partnership”. LS&S said “our ability to meet and exceed expectations” will help the city to sell a bond to 2/3 of voters. They offer to expand hours from 51 a week to 69 and be open on Sundays. A woman said she supports privatizing. Said when she complained that the metal detector was broken she was told theire wasn’t enough money. She said she was tired of all the communists in the library. A man: “I propose that we outsource the city mgr and city attorney, the highest paid in California. Michelle Peralta, the library’s archivist said she has seen nothing in LS&S’s plan on how it would operate the library’s special Pioneer Room collection. 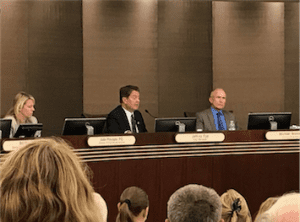 A deeply divided Escondido City council voted 3-2 to move forward with negotiations with Library Systems & Services to outsource Library services. Olga Diaz and Michael Morasco voted no. Many things are left up in the air by the vote, including a possible legal challenge. Check the T-A soon for more details.